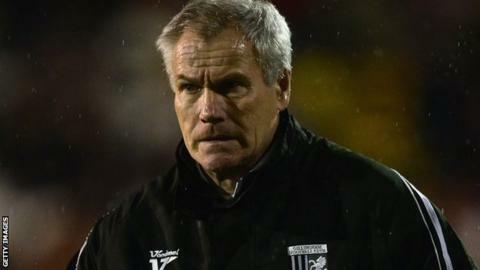 Gillingham manager Peter Taylor says the uncertainty over his future and the club's fate is preventing him from offering new contracts to players. Taylor's deal runs out at the end of the season, while the Gills are five points above the League One drop zone. "There is no other way it can be done," Taylor told BBC Radio Kent. "The players, to be fair, are very realistic and understand the situation. They know they are not going to get any work guaranteed until we are safe." Taylor joined Gillingham as interim manager in October and a month later signed a contract to remain with the Kent club until the end of the season. Why would anybody all of a sudden give someone another year's work when you think people could be doing better and we are in the position we are in? Gills striker Adebayo Akinfenwa said the former Brighton, Leicester and Hull boss "lifted a black cloud" after his appointment, while forward Craig Fagan believes the club could challenge for the play-offs next season if Taylor remains in charge. However, having lost their last three games, the Gills are still in danger of relegation with four games of the campaign remaining. "You don't know who the manager is going to be next season to make that decision on whether a contract gets renewed or not and you don't know what division you are going to be in until you are safe," the 61-year-old added. "If you looked at the performance last Saturday [a 5-1 loss against Leyton Orient], which was a disappointing one for us, why would anybody all of a sudden give someone another year's work when you think people could be doing better and we are in the position we are in?" Gillingham captain Adam Barrett, who has one year left on his current deal, says the contract situation at Priestfield puts more pressure on the players. "At the moment there are players who come the end of the season are out of a job," the 34-year-old centre-back told BBC Radio Kent. "That is the reality of it. "Sometimes it can be a hindrance as people have got families and mortgages. It is not a nice time of the year as there are hundreds of footballers out of contract looking for clubs, fighting and scrapping. "The sooner we get the points that keep us up and the manager knows what is happening with himself then the sooner those things will get resolved. "There is no-one wanting to win more than the players."